Knights of Creativity Spirit & Ale: Don't put off today, what you can easily put off tomorrow. Don't put off today, what you can easily put off tomorrow. I know you Knights and Ladies are out there....... There's a great big long List of you at the bottom of the page. I know you all like a bit of drinking and a bit of thinking...and that is just such a short step to a tiny bit of writing, possibly about what you've been drinking and thinking. 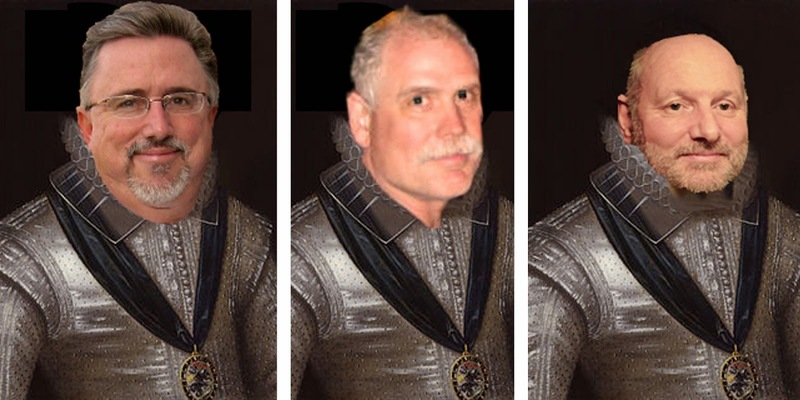 I'm sure Sir Bowie and Sir Hook will be glad to put it up here for you, if you ask them for their email addresses in a comments box. Its what they do for me. Everybody thinks about writing, sticking a bucket in their river of thoughts and getting everybody to take a look inside it, but like painting and poetry, everybody thinks they are a) no good at it.. b) what they have to say is unimportant c) I haven't the time...(I need to watch TV instead )and D) well, what's the point.? What's the point?.. well what's the point of anything then in that case. The meaning of Life is to find your gift. The purpose of Life is to give that gift away,.....and if you want to write and tell us about it, then even better, you never know we might want to join you with it, and give it away too. I think its called being Human, or at least Human Being. Its what the KMSA is all about. Non committal sharing. Oh I can tell you think its a good idea, but maybe tomorrow, no actually you'll round it up and definitely start January the first, Even buy a special Moleskine for Christmas to jot things in. tut tut, I'll believe you, Thousands wouldn't. See? its even got your name in the title. and its full of advice, tips and motivation for those of you whose pen is poised over a blank page, and for those of you who still need to borrow a pen. Anyway, I hope you don't mind me bringing the subject up. It was on my mind so I thought I'd get it out there. And if you are still struggling to start even the teeniest bit of creative writing,....... then I know any weekend now you are going to sit at a table and write out a mound of Christmas cards to friends, so why not try thinking up a daft 3 or four line ditty, of your very own, okay make it two lines then... something like ; "Here's to a stress free Christmas / May your tree lights work first go / May you find good cheer/ In a Holiday Beer/ With Family, Friend and Foe." well, that might need some work....but it means soo much more than just signing it. Sir Dayvd ( Write is might ) of Oxfordshireness on the wold. I can't wait to read this blog... tomorrow (I know, I know. Too obvious). Anyway, the plea is sincere. 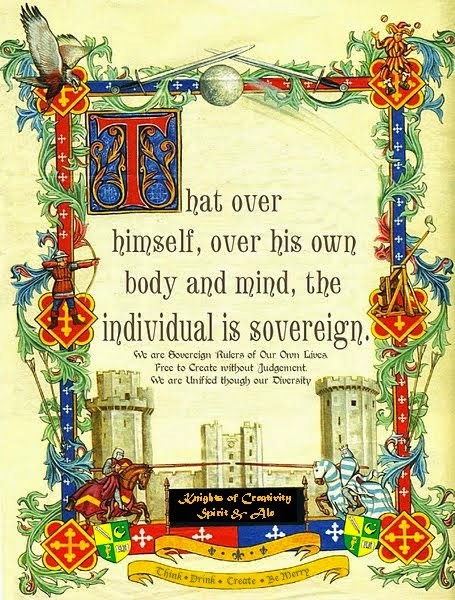 And don't forget the Knights motto -- in part -- we're free to create without judgment. Have a drink. Think. Be Merry. And Write. I think I'll wait until tomorrow. Ditto to Sir D's blog and Sir B's comment. How's that for thinking and creative writing?! LOL! To quote Pat Benitar, "Why don't you hit me with your best shot? Hit with me with your best shot. Hit me with your best shot...fire away!" Remember, you can keep the pro, take away the crastinating, and add the gressive...and create a progressive life! May the best team win today,... and get to lose to the Eagles in the Superbowl. Saints 10 and ) looking good there for a bet. Yeah, I manage 3 NFL Fantasy Teams in 3 Different Leagues. My Finland League is kicking my arse...but I have struggled from the bottom to second place. I named that team the Knights, after the KMSA. My third League is a family league where I remain undefeated this season and for the past three seasons! the Storm! Named after the November Tornado that tore up Newbugh a few years ago. So, I'm working hard at being a Couch Coach. I have a bet with the manager at Starbuck's for free drinks all week that the Saints beat the Patriots. She's from Boston. Already won the bet with her when they played the Colts. I made here wear a I'm a Colts Fan button all week. Colts will go undefeated again today....and I take Arsenal over Chelsea. Eagles, will be molting in their nests come Super Bowl Time...sorry Mate! Thats a lot of leagues there coach...i thought you were telling me you don't have any spare time??.. I procrastinate BY writing. Does that count? Well I, er, never mind. Anyone else need a nap?